Monster Jam®, the family entertainment show featuring the largest recreational trucks in the world at a massive 12-foot-tall, 5 tons, is making its way back to Kansas City, Feb. 6 – 8, at the Sprint Center. 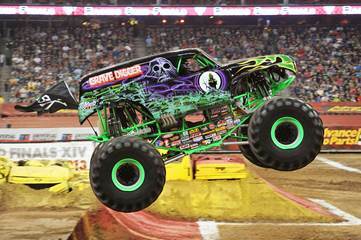 The Kansas City show will feature eight Monster Jam trucks, including 4-time Monster Jam World Finals champion Grave Digger® driven by Jon Zimmer. Tickets are on sale now and affordably priced for the whole family with seats starting at $10. Friday, Feb. 6: 7:30 p.m.
Saturday, Feb. 7: 2 p.m., 7:30 p.m.
Sunday, Feb. 8: 2 p.m.
Monster Jam tickets are available online at SprintCenter.com, in person at the Sprint Center Box Office, charge-by-phone at (888) 929-7849, or online at AXS.com. Additionally, “Party in the Pits” passes are available before the 2 p.m. show on Feb. 7 and 8 from 11:30 a.m. – 12:30 p.m. for $10. Party in the Pits is a pre-show experience that provides fans with unparalleled access by allowing them onto the actual racetrack where they can meet the drivers and get autographs, take photos, get up close to the Monster Jam trucks, and explore the obstacles the Monster Jam trucks will jump over and eventually destroy during the show. For more information on Monster Jam, please log onto www.MonsterJam.com. To follow Monster Jam on Facebook, Twitter and Instagram, visit www.facebook.com/MonsterJam, www.twitter.com/MonsterJam, and www.instagram.com/MonsterJamLive. Subscribe to Monster Jam’s YouTube Channel at www.youtube.com/MonsterJamLive. Feld Motor Sports, Inc. is the world leader in specialized arena and stadium-based motor sports entertainment. Feld Motor Sports productions include Monster Jam®, Monster Energy Supercross, AMSOIL Arenacross and Nuclear Cowboyz®. Feld Motor Sports is a division of Feld Entertainment, the world’s largest producer of live family entertainment. Official Monster Truck Series only at MonsterJam. For more information on Feld Entertainment, visit www.feldentertainment.com.